July 2018. 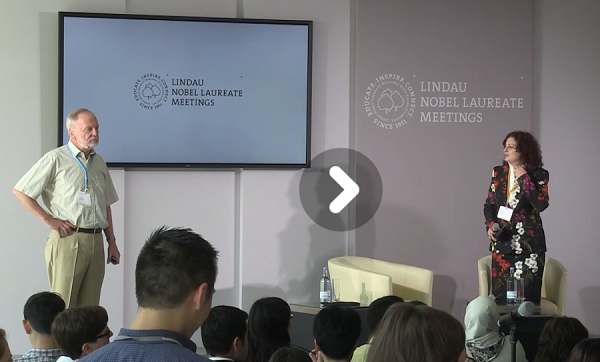 Once every year Nobel Laureates convene at Lindau in Germany to meet the next generation of leading scientists, including undergraduates, PhD students and postdoc researchers from all over the world. The Lindau Nobel Laureate Meetings foster the exchange between scientists of different generations, cultures and disciplines. The meetings are known for their informal atmosphere and offer many opportunities for exchange for all participants. This year's Lindau Nobel Laureate Meeting took place from 24–29 June 2018. Thirty-nine Nobel Laureates and 600 international young scientists gathered together at Lake Constance in Germany. The meeting was dedicated to physiology and medicine. As a medicine meeting, it set two records: never before have so many Nobel Laureates taken part, and, with 84 nations represented, never before have the participants come from so many countries. 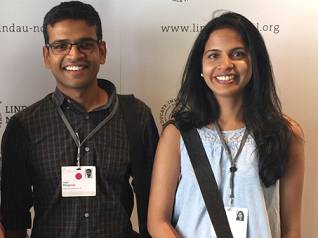 Among the participating postdocs were Sissy Kalayil and Sagar Bhogaraju from the Dikic lab at Goethe University's Buchmann Institute of Molecular Life Sciences.